ACT engages youth and women in policy advocacy to create meaningful change. 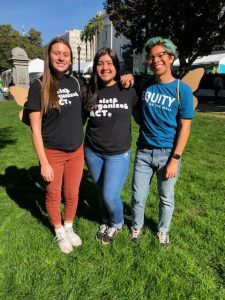 ACT's legislative and policy advocacy centers the young people and womxn of the Central Valley of California at the State, Regional, and Local level. We work within a reproductive justice framework at the intersections that directly impact the Central Valley (immigrant rights, environmental justice, economic equity, rural access, etc) and provide opportunities within our leadership programs for young people to engage in the legislative process. Our policy priorities promote womxn & young people's access to healthy, thriving, and engaged lives regardless of identity. Please read about our local policy campaigns here. SB 24 (Leyva) – Student Right to Access Act (mandating medication abortion on public university campuses). Re-introduced. AB 2601 (Weber) – Expanding CA Healthy Youth Act (Comprehensive Sexual Health Education for all Public Schools) to Public Charter Schools. Signed into law. AB 2289 (Weber) – Young Parent Family Leave Act. Signed into law. SB 320 (Leyva) – Student Right to Access Act (mandating medication abortion on public university campuses). Vetoed. SB 982 – Raising the CalWorks Floor to Lift Families Out of Poverty. SB 320 (Leyva) – Student Right to Access Act (mandating medication abortion on public university campuses). Held in committee. SB 54 – CA Values Act (protect undocumented Californians by ensuring state & local resources are not used for deportation proceedings). SB 1014 (Chu) – Young Parent Family Leave Act. Held in committee. SB 10 – Health4All Adults. AB 329 – CA Healthy Youth Act. Comprehensive Sexual Health Education for all Public Schools.